Our right of responsible ownership of dogs is constantly put in jeopardy by a well financed small group of activists who are working to create what they call "animal rights." The rights that they want to "give" to animals are to be taken away from animal owners. The BCA (Bulldog Club of America) Legislative Committee seeks to promote the best interests of purebred Bulldogs by encouraging adoption laws, rules, ordinances and legislation favorable to these interests, and by discouraging adoption of all those that are not. 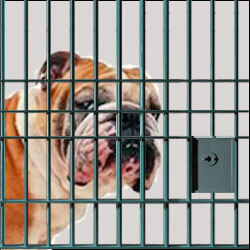 It is up to all of us to act to protect ourselves from unfair laws concerning dog ownership. Learn which state legislative committees are working on dog laws, arm yourself with knowledge and information about proposed legislation, and contact your legislators to let them know your position. In short, be active in protecting your rights as a dog owner! Find out how you can stay informed and help on current issues affecting your rights as a dog owner at the Bulldog Club of America's Advocacy page. How to write, meet, and call government officials with maximum effect.